Synology DiskStation is the perfect server replacement tool that will allow you to centralize storage and backups while enabling powerful file sharing and easy remote access. Are you looking for a robust way to share important files? At Phintec, we know that business is always evolving, and in order to keep up you and your employees need access to an ever growing number of files and systems. In order to do this, you need powerful servers and storage solutions. There's only one problem: Traditional servers are bulky and expensive to maintain. Phintec has the solution for you: Synology DiskStation. 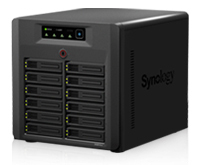 Synology DiskStation is a range of Network Attached Storage (NAS) devices that offer all the features of a server, at a fraction of the size and cost. If you are looking for a high-performance, full featured server replacement that is not only easy to manage but is also affordable, look no further than a DiskStation solution from Phintec.